As we begin 2017, I wanted to share with you some changes that will affect my clients’ daycare, training and boarding choices in the New Year. The year 2016 completed the 11th year of business for Acme Canine. As I begin the 12th year, I am following a different path, concentrating my efforts on in-home dog and puppy training and authoring an online blog, “News from Canis Lupus Familiarus”. I have decided to discontinue daycare, overnight training and boarding services and sell the Lewis Center facility. I am proud to let you know that the Lewis Center facility has been sold to Passion Four Paws, LLC, who is open for boarding and daycare services at the same location beginning on March 1, 2017. 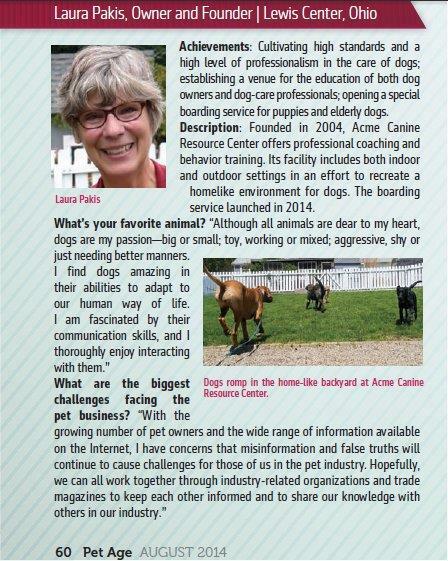 Many of you may already be familiar with the owner of Passion Four Paws: Aimee Gioia, a certified trainer who has been working at Acme Canine for the past 10 months as Kennel Manager. Many of you have received emails from her or talked with her at the facility. Rest assured Passion Four Paws is committed to providing the same high-quality and caring environment for your pets that you have come to expect from Acme Canine. Aimee is extremely passionate about her work, and could not be more excited to take over operations at the Lewis Center facility. We are both committed to making the transition process as seamless as possible for all involved. We’ll still be able to stay in touch through the monthly e-newsletter, The Bark; Acme Canine’s Facebook page and Spike’s Dog Blog. For those of you who have taken advantage of Maintenance Meetup, I’ll be expecting to see you at 2:00 on the third Sunday of each month, although the location may vary. And you might even see me at the facility during the transition or when I board my dogs there. I truly have enjoyed being of service to those who have used Acme Canine. It wasn’t an easy decision for me to make, but it’s been made much easier knowing you’ll be in good hands with Aimee. This entry was posted in The History of Acme Canine and tagged Acme Canine. Bookmark the permalink.